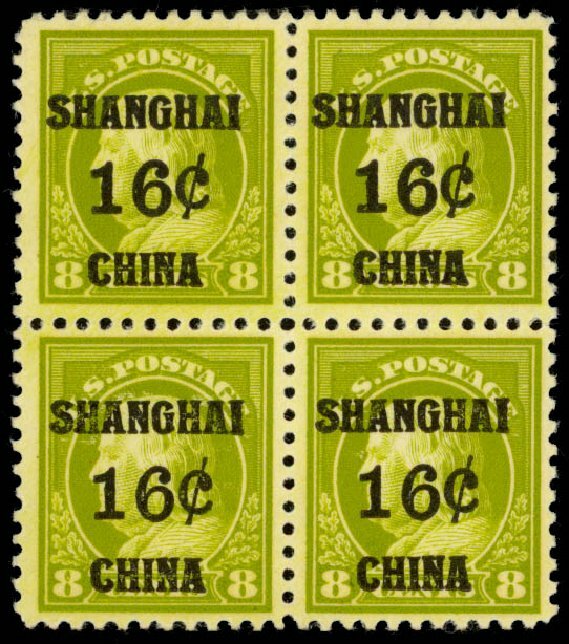 U.S.; Offices in China, 1919, 16¢ on 8¢ on Cover to Canada, Scott #K8, Stamp fine to very fine tied by cds Jan 2 1920 from Shanghai “Savoy Hotel” to Petrolea, stains and rips in envelope, scarce usage. Estimate $325-350. 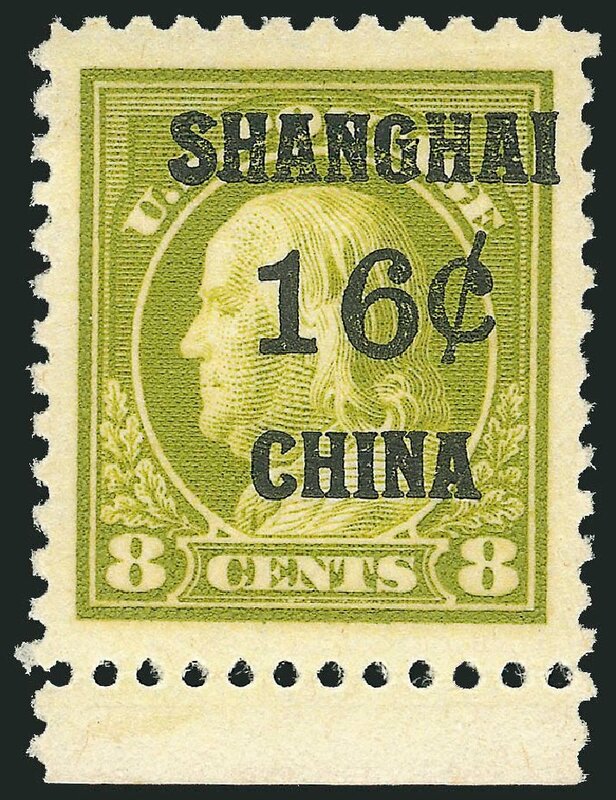 U.S.; Offices in China, 1919, 16¢ on 8¢ on Cover to U.S., Scott #K8, stamp fine to very fine, with cds Dec. 29th 1922 to Cleveland Ohio, Fine to Very Fine. Estimate $130-150. 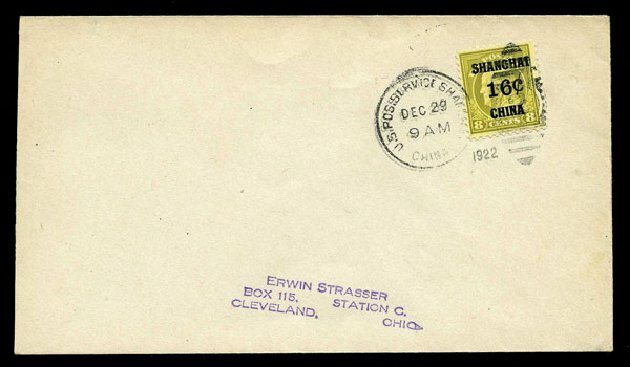 U.S.; Offices in China, 1919, 16¢ on 8¢ on Cover to Ohio, Scott #K8, stamp fine to very fine, with cds Dec. 29th 1922 to Ervin Strasser, some small staining on cover, Fine to Very Fine. Estimate price $140-160. 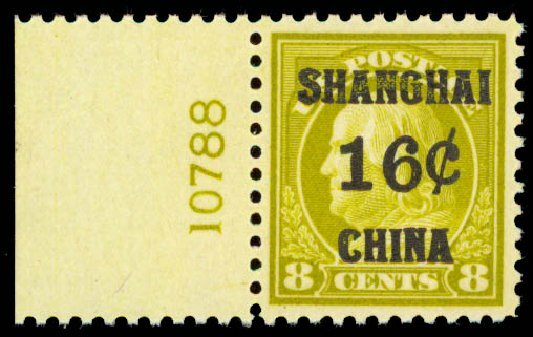 Offices in China, 1919, 16¢ on 8¢ olive bister (Scott K8), left margin single with plate number, o.g., never hinged, choice centering and vibrant rich color, an immaculate mint example, Very Fine to Extremely Fine, 2015 P.S.E. certificate graded VF-XF-85. SMQ $290 in the grade of VF-XF-85. Scott $180. Estimate price $200 – 300. 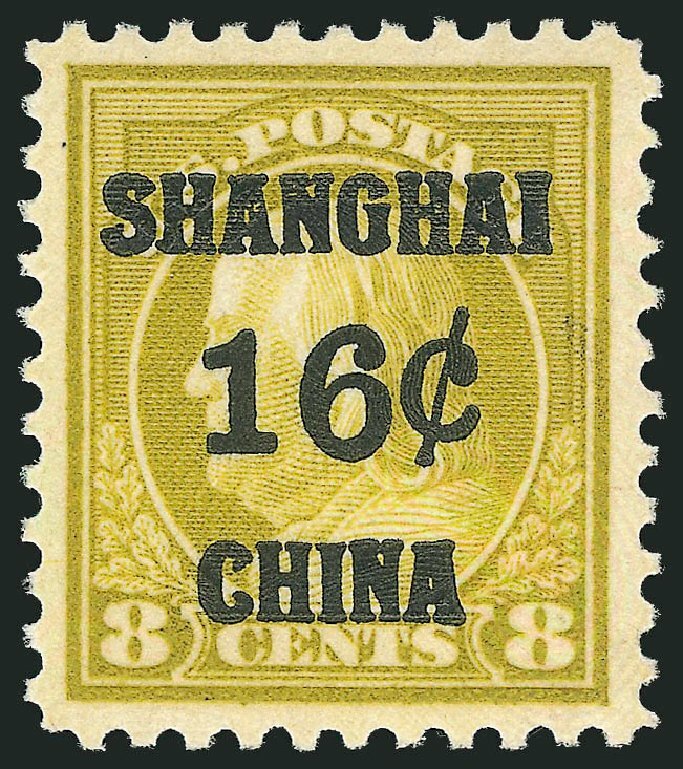 Offices in China, 1919, 16¢ on 8¢ olive bister. 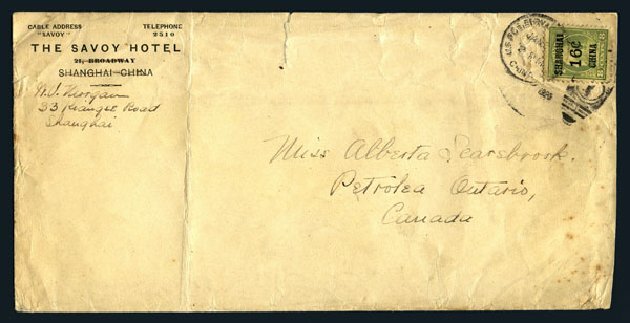 Left margin plate block of 6 with plate number 7748, disturbed o.g., gum crease affecting 3 stamps, “RWB” handstamp (Rudy W. Becker, B.I.A. #1) on plate single, usual staple holes in selvage, deep color, Very Fine and attractive. Scott No. K8; $625. 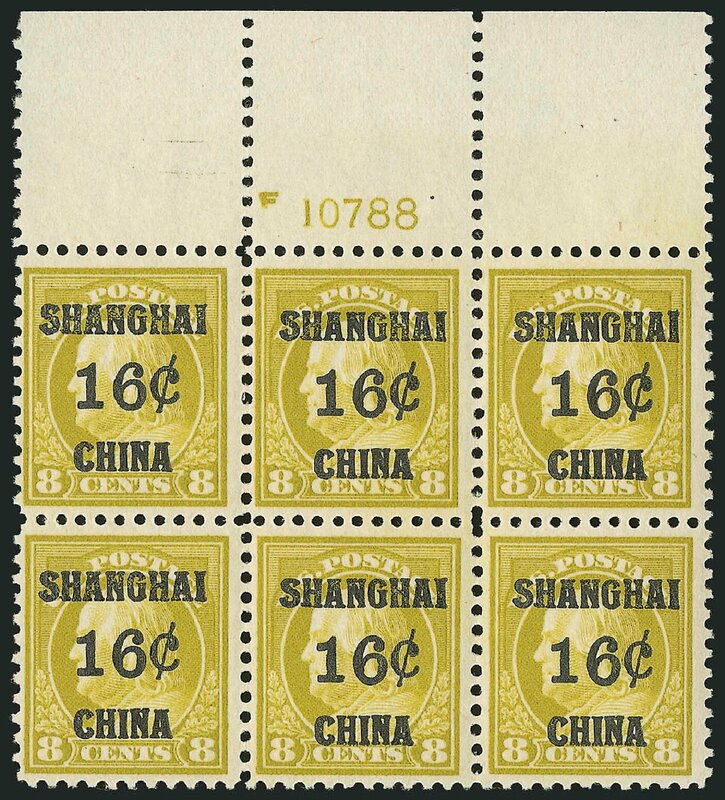 Offices in China, 1919, 16¢ on 8¢ olive bister. Right margin plate block of 6 with plate number 10786, o.g., plate number stamp l.h. with bit of hinge remnant & with “RWB” handstamp (Rudy W. Becker, B.I.A. #1), Very Fine. Scott No. K8; $625. 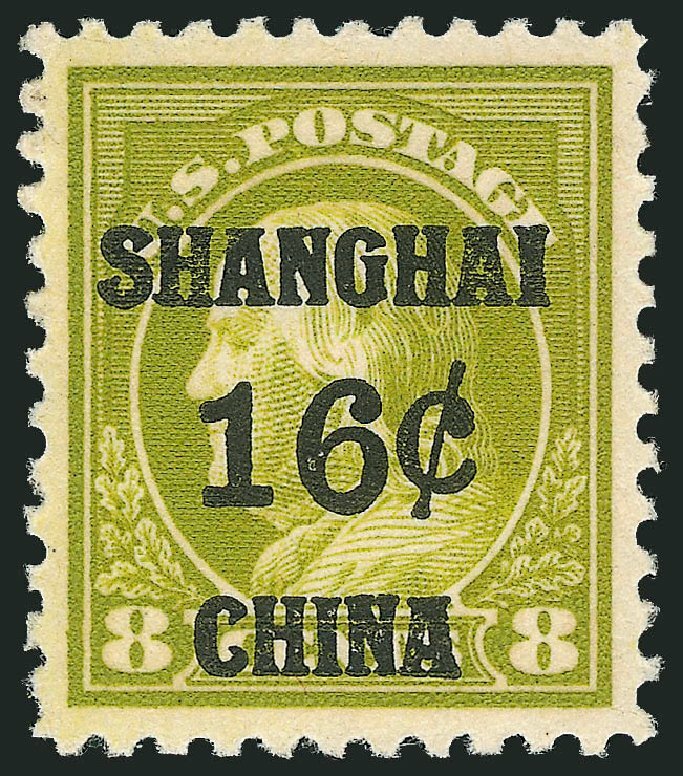 Offices in China, 1919, 16¢ on 8¢ olive bister. 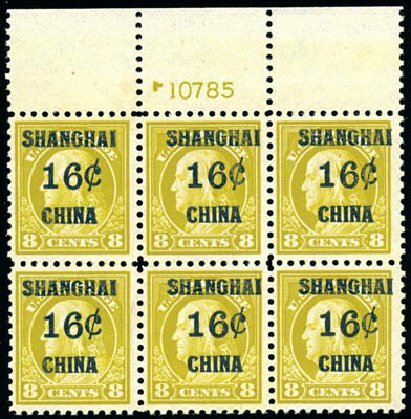 Top margin plate block of 6 with plate number F10785, o.g., lightly hinged at top, never hinged at bottom; some toning affecting gum, Very Fine. Scott No. K8; $625. 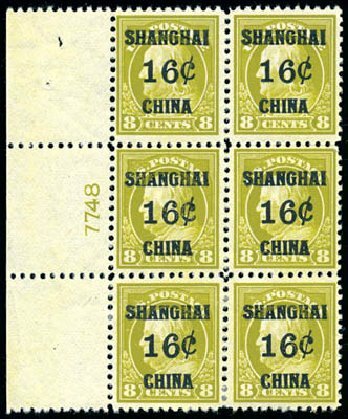 Offices in China, 1919, 16¢ on 8¢ olive bister. 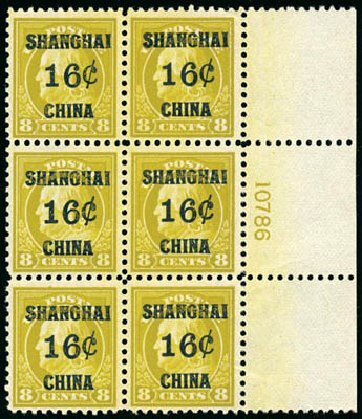 Bottom margin plate block of 6 with plate number 10788, o.g., never hinged (minor natural gum skips), deep color, F.-V.F. Scott No. K8; $1,150. 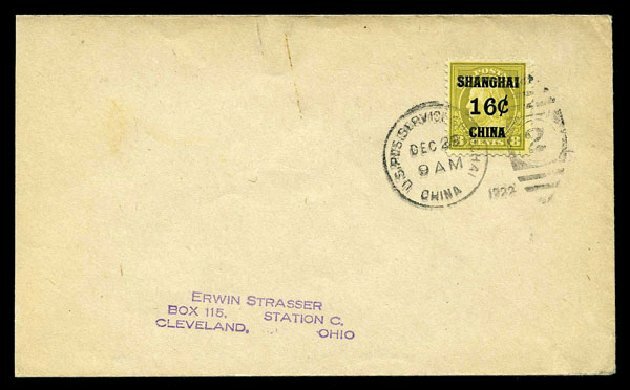 USA (Scott K8a) 1919 OFFICES IN CHINA 16? ON 8? 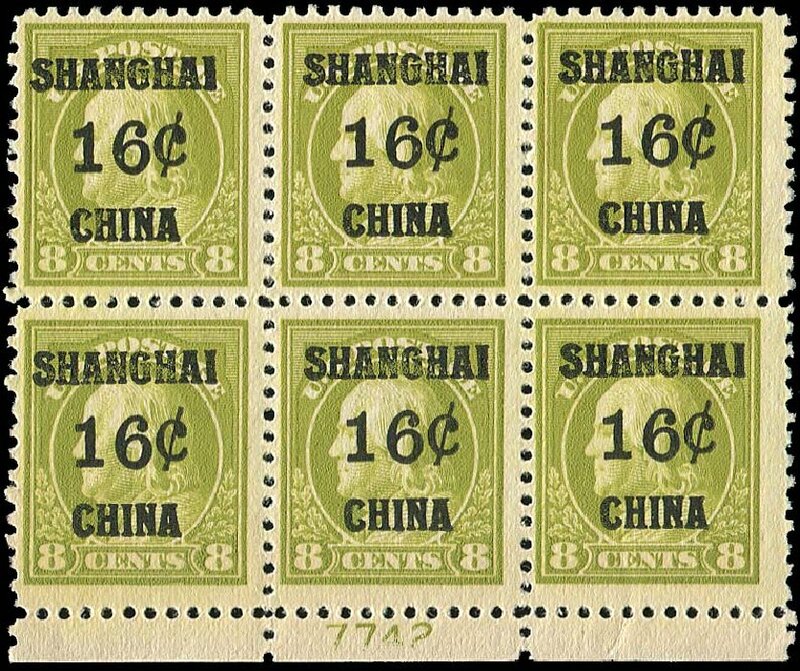 OLIVE GREEN (BOTTOM PLATE) Bottom plate block of 6 (plate #7742). Fresh, MINT never hinged, fine to very fine. 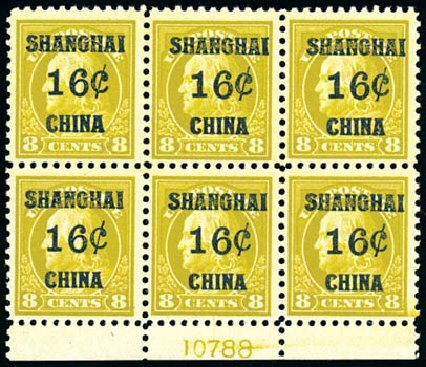 (2002 APS Cert #140270) Cat price $1000. 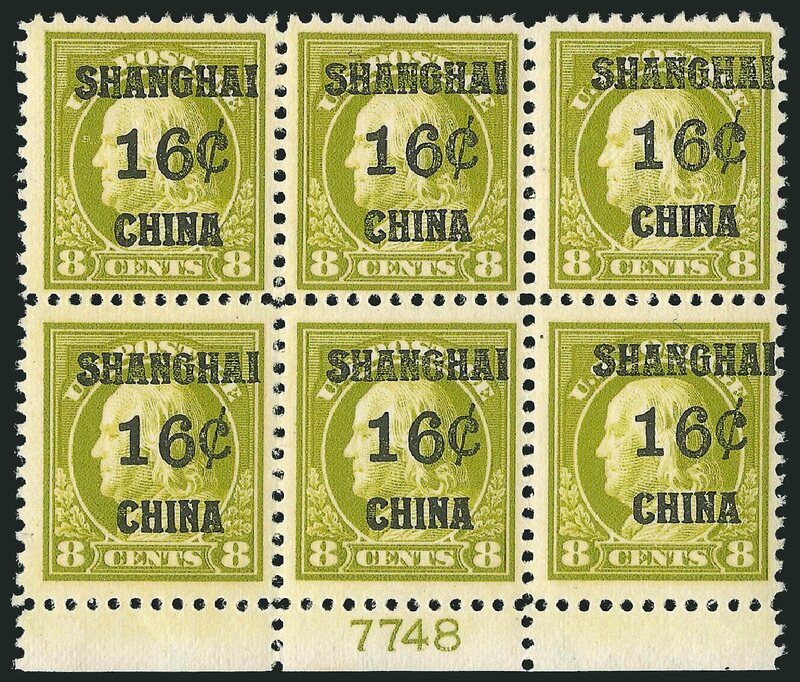 Offices in China, 1919, 16¢ on 8¢ olive green (Scott K8a), block of 4, o.g., never hinged, fabulous Post office fresh block in immaculate condition, strong olive green shade, Very Fine, 2012 P.S.E. certificate. Scott $640 for singles. Estimate $500 – 750.